Author, Colson Whitehead is indirectly responsible for my friend and I accidentally joining a book club. We thought we were going to a book discussion just about his book, Sag Harbor, which we both loved. When we got to the discussion, we were at least twenty years younger than the other participants who all hated the book. They felt the book had no story arc. 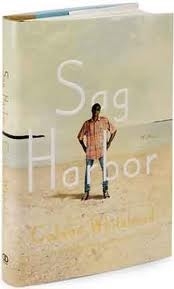 We loved the vignettes of a teenage boy coming of age in the resort community of Sag Harbor, Long Island. Set in 1985, it is the story of a fifteen-year old boy who attends school in Manhattan and summers in Sag Harbor. My friend and I loved the references to 80's pop culture such as Hacky Sack, Dungeons & Dragons, Members Only jackets, and New Coke. We loved all the specific references to the east-end of Long Island. (I actually bought the book in BookHampton in Sag Harbor.) Most of all we loved the humorous look at coming of age from a boy's perspective. Mr. Whitehead applied that same humorous writing to his essay, "How to Write" in yesterday's New York Times. Read it here. I'm sure it will make you smile, and if you haven't read Sag Harbor yet, I think you'll like that, too, unless of course you are a member of the book club I accidentally joined. At the end of the discussion about Sag Harbor , the facilitator distributed the next book. My friend and I looked at each other and realized we had just joined a book club.